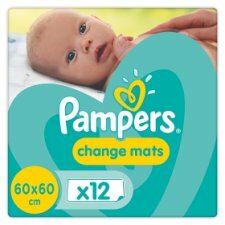 Pampers ChangeMats are absorbent disposable mats for use when making nappy changes on the go. A waterproof backsheet provides a clean and comfortable surface for your baby, while the super absorbent core acts just like a nappy. Easy to fold and small enough to fit in your bag, ChangeMats can be taken with you everywhere you go.